This is my last non-Thanksgiving recipe that I am posting until after Thanksgiving. 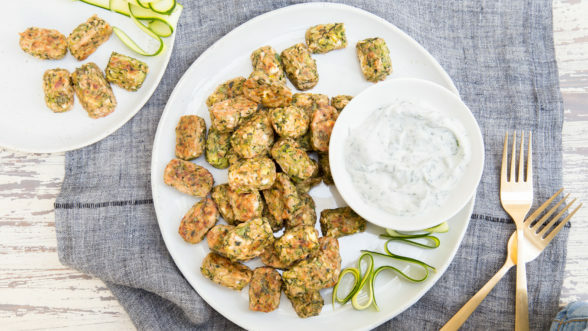 I am only posting the recipe for these zucchini tots because so many people keep asking me for the recipe since I taught it in September. I keep saying, “zucchini aren’t in season after October.” “I don’t care! I must have this recipe!” I have to admit, they are really fun to make and eat. Anything that looks like a tater tot is a shoe-in with kids. I know some kids won’t eat anything green, but I also know you have to keep trying. For the rest of their lives. End of story. The only downside of this recipe is that it is a little more time-consuming than roasting a few zucchini. But I think this preparation is so full of flavor and a little more interesting than basic grilled or roasted zucchini. At least to my husband and my kids. We’re also adding some protein in here, so you could conceivably give these to your kids with a cup of tomato soup and call it a day. Like all my recipes, I can help you adapt this to any diet or allergy. Most of the subs are listed with the ingredients, but if there’s a specific food you need to omit and I haven’t mentioned it, just leave me a comment at the bottom. I do recommend owning a nut milk bag for times like this when you need to squeeze the daylights out of the zucchini to remove as much water as possible. I have two nut milk bags – one for making nut milk and one for squeezing vegetables like frozen spinach, potatoes, and zucchini. I use this one by Ellie’s Best. You can see if this coupon code Pamela10 still works on their site. Nut milk bags are made of nylon and last forever without tearing, as opposed to thin kitchen towels, which do easily. 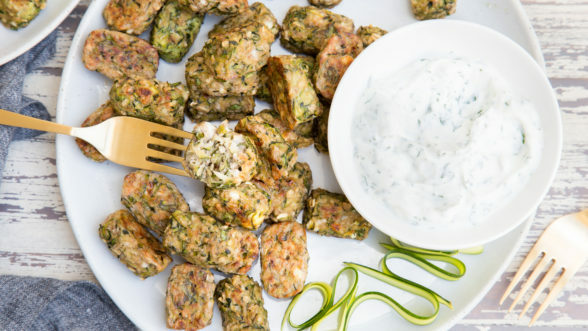 Even though zucchini aren’t in season in the late fall and winter, I do think these would be a great game day snack. 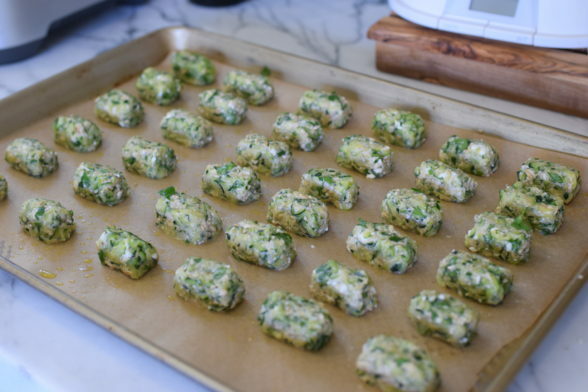 Check out the note at the bottom of the recipe for how you can freeze and reheat these. You can make them today for the Super Bowl, haha! My family loves dipping food in anything. We have used warm tomato sauce, mustard, and the herbed yogurt sauce from my cookbook, which by the way would make a great hostess gift if you are invited anywhere for a holiday! I hope you all have a safe and fun Halloween. Just going to mention that this is when people fall off the wagon and start going crazy with sugar from now until January 1. I have a great idea – how about if we don’t go crazy on sweets and eating twice as much as normal because we’re going on a cleanse on January 1st? My goal is to be really conscientious this holiday season, starting tomorrow! Place the zucchini in a colander and sprinkle with ¼ teaspoon sea salt. Toss well and let stand for 10 minutes, tossing occasionally. Meanwhile, preheat the oven to 400 degrees. Line a baking sheet with parchment paper and brush with olive oil. 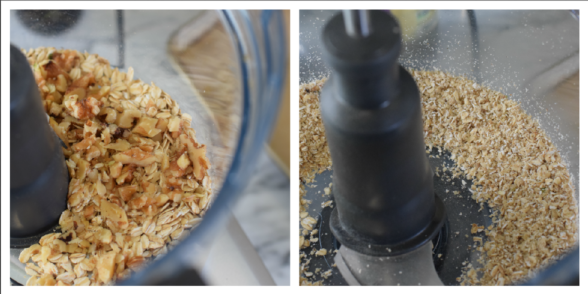 Place the oats and the nuts in a food processor and process until finely ground. Place in a large bowl and set aside. When the zucchini is done soaking in the salt, place it in a nut milk bag or a thin kitchen towel and squeeze out all of the excess water. 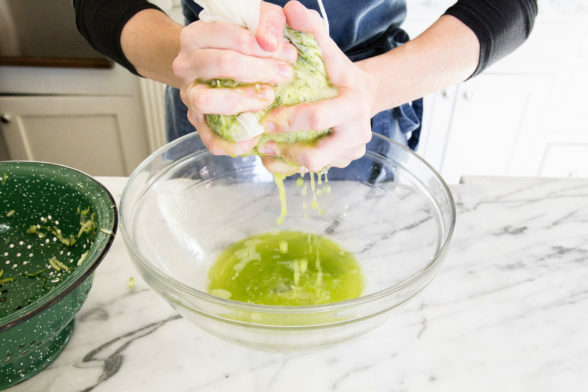 Do not rinse the zucchini! 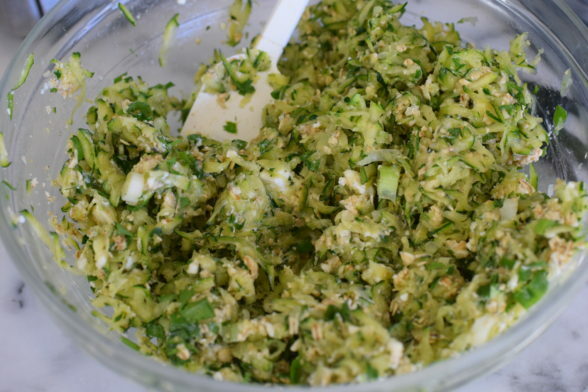 Add the zucchini, green onions, herbs, garlic powder, pepper, cheese, ½ teaspoon salt and eggs to the bowl with the oat/nut mixture and stir well to combine. Spoon a Tablespoon of the batter and use your hands to shape into a tot. Place on the cookie sheet and repeat with remaining batter. Bake until golden brown, about 20-22 minutes, flipping halfway through baking. Baked tots can be frozen and can be cooked from a frozen state in a preheated 350 degree oven for 15 minutes. Just used the code Pamela10 for the Nut Milk Bag and it worked! Looking forward to trying this tot recipe! Wow! I’m surprised the code is still active. That’s cool! When you make these tots using Kite Hill Almond Cream Cheese, do you recommend the plain flavor or the chive cream cheese style spread? Thanks!! I like them both, but the chive is my favorite! This looks delish! can I sub broccoli for zucchini if I blitz in food processor? Thank you! Not sure, Jessica. I might consider blanched broccoli or frozen, defrosted broccoli (which has already been blanched) and moisture squeezed out. Can these be passed at a party as a finger food? Can you make the mixture the night before and bake the next day? Not sure and I would guess it wouldn’t work as well since the tots would get soggy. Does it matter if the oats are quick cook? Any chance there are substitutes to make this recipe vegan? You can definitely sub a vegan cheese. I tried the Kite Hill almond milk cheese and it was great. You can try a flax egg and see if that would help bind them. I think it will work, but I can’t say for sure. glad you shared I am totally making these! !